Since I first started bundling together a few of my favorite colors into mini-skein sets, people have been asking me what they should do with them. Which is a fair question. To me they are prompts to creativity and an excuse to try to use more color in my knitting, but as someone who often has a hard time making decisions I can see how having more color options could also be overwhelming. So, spurred on by the knowledge that people would again be asking, “what should I do with these?” at the recent Boston Farm and Fiber Festival, I put together a couple of pattern suggestions. (Disclaimer: these have not been test knit by anyone other than me). A set of high or low boot toppers can be knit with one of my mini-skein sets, though you won’t have much yarn left over, so if you increase the number of pattern repeats you may want to shorten them by a row of each color to avoid yarn chicken. 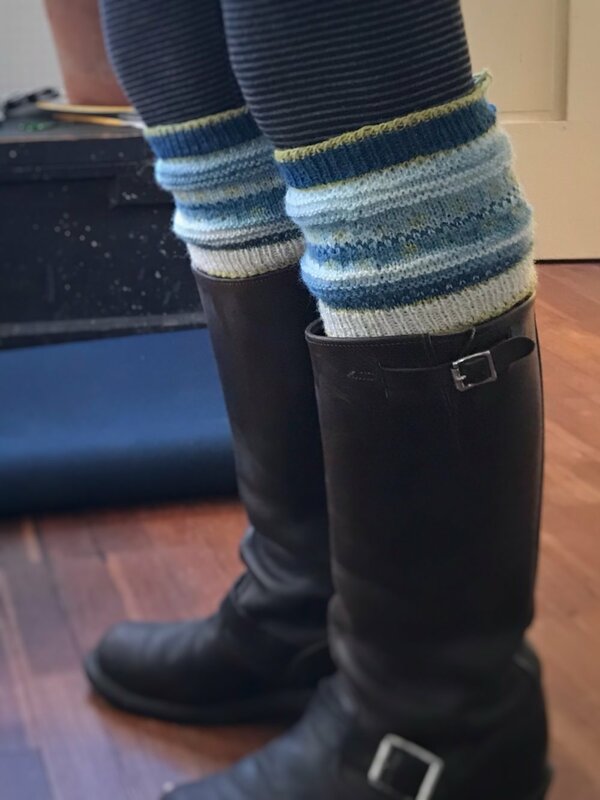 Toppers for Short Boots - Land colorway (these would also make good arm warmers). But if you like, these patterns are just a starting point for your own creativity. I use Stitch Fiddle (available in a free version) to “sketch” patterns. With this fairly intuitive program you can easily make graphs, which, when combined with a book of pattern motifs (like Mary Jane Mucklestone’s 150 Scandinavian Motifs) makes for a fun afternoon of color exploration. As of this writing I have three mini-skein sets in the Land color way available in the shop, but last week the yarn spun from the 2018 Straw’s Farm Island fleeces returned from the mill, and I can’t wait to start playing with it! (That said, it could be a little while before mini-skein sets are restocked, for which I apologize).